The immunogen is Aflatoxin B1 (AFB1)-BSA conjugates. 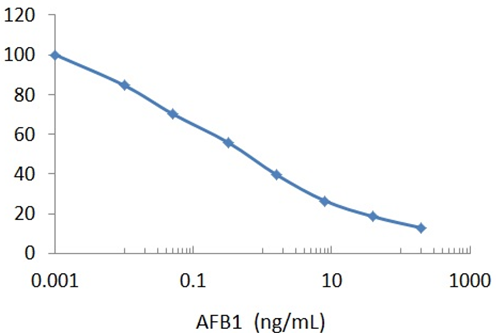 The antibody was affinity purified with an AFB1-Agarose column and competitively eluted by free AFB1. The antibody was conjugated to peroxidase (HRP) by reductive amination. This anti-AFB1 HRP conjugates could be utilized for detection and quantization of the food-borne mycotoxin AFB1. Direct competitive inhibition ELISA using immobilized AFB1-BSA (ICP1203, 0.1 ug/uL) and anti-AFB1 HRP (0.1 µg/µL), 50% inhibition occurred at 0.5 ng/mL of free AFB1 under a non-optimized condition. 0.5 mg/mL in PBS, 1% BSA, 0.01% proclin in 50% Glycerol or lyophilized powder. Antigen-specific affinity chromatography and free antigen competitive elution system. The antibody recognizes Aflatoxin B1 specifically; cross reactivity to other aflatoxins not tested yet. Aflatoxin B1 is a food borne mycotoxin which is carcinogenic to both humans and animals. Contamination with AFB1 in food may be harmful to humans and animals. Product is stable for 3 months at 4°C or 6 months at -20°C. Expiration date is 6 months from date of shipping if stored properly.